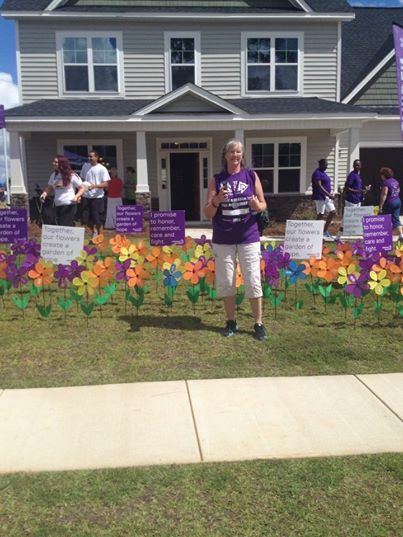 Today was the 4th Annual Walk for Alzheimer’s in Fayetteville, NC. I’ll be honest, I am not the best volunteer or supporter, but as you all know this is near and dear to my heart. I signed up to walk a couple of months ago. I put my fundraising goal at $100. Within 24 hours, my brother-in-law, Ned had given $100. How wonderful, but since I had three months left before the walk, I raised my goal to $500. My closest friends were wonderful. I very much appreciate their support and donations. As of last week, I was still $300 away from my goal. Jeff Wright with Southeastern Construction of Rockfish came into the office and gave me a check for $315 to put me over my goal. With a few more donations from some coworkers, I raised over $600 by myself. It is such a little thing, but there are times when you feel so helpless that any little thing that you can do to contribute makes you feel more in control. The walk was this morning and I met my business partner, Stefanie Baber, at King’s Grant, where it was held. It was cloudy part of the morning, which did help a little because it was so hot!! It was wonderful to see so many people gathered to help raise money and to honor the cause. It was also very emotional. When we had the opening ceremony and they introduced a man that is currently residing in a local nursing home for Alzheimer patients and told his story, it made me cry. I know what his wife and family are going through and I so feel for them. Stefanie was sniveling also. She was there to support me and to walk for her grandmother. Next year we will become even more involved and volunteer to help plan and set up. There have been so many developments in so many horrible diseases that I can only hope that there will continue to be progress made towards finding a cure or prevention for Alzheimer’s. If you have the opportunity to participate, please take a few minutes and show your support. It helps to be around others that understand! This entry was posted in Uncategorized and tagged Aging, alzeheimer's, Alzheimer's, Dementia, Elderly, Memories on September 6, 2014 by debbiewaitleybroker. Excellent and good for you for taking part in the walk. Congratulations to you for doing something positive in dementia’s name!